There are others who think they sound like Connee when they sing (especially in the shower when the water’s really running hard). There are others who daydream in the office and try to rewrite the company’s mission statement in gibberish. There are others who hit the refresh key every two seconds when the clock is counting down on an Ebay auction for an autographed Bozzie photo. There are others who think they are the only ones who listen to and love the songs of the Boswell Sisters. Oh children, you are not alone. There is probably someone out there who has been bitten even harder by the Bozzie bug than you have. As you search through You Tube for things Boswell you cannot miss the work one JeriLynn Karr. She is a great fan of the Bozzies and her prolific video output has not only turned a lot of the You Tube generation onto the Sisters’ sound, she has actually found others to sing the Sisters’ harmomies with her out there on the lone prairie! The Wizard of Boz once compared the internet of today with radio of the 30s in its ability to stretch across the nation and inspire people. Ms. Karr is one of the inspired and her story of family, friends and the Boz is inspiring. 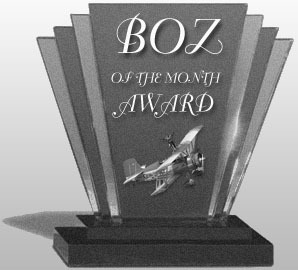 It has earned her a spot among the rarified club of the Boz of the Month. Bozzies.com recently heard from author and educator James Von Schilling and learned that he is a long-time Boz Buf. Jim was part of the small group of young people who rediscovered the Boswells during the nostalgia wave of the early 70s. He was fortunate to have had the chance to interview Connie Boswell, to meet Vet, and to have written about them at the beginning of the first Boswell renaissance. The Boswell Sisters: My Personal Story.